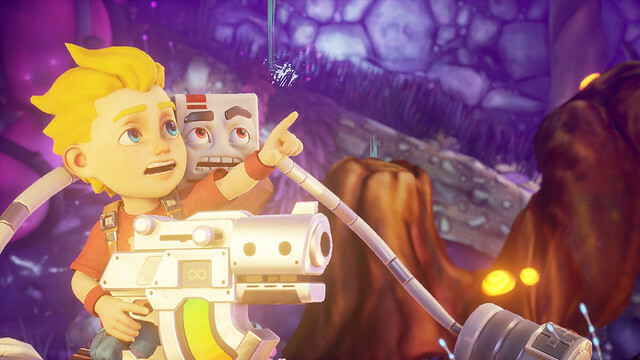 From the developers of the Duke Nukem series, a retro styled 2.5D platform game about a boy who gets sucked into his game console to ‘restore the Elder Tree as guardian of the land’ Taking its inspiration from games like Commander Keen, Conker, Ruff n Tumble and Jazz Jackrabbit the game aspires to bring back the 90s with a blast. 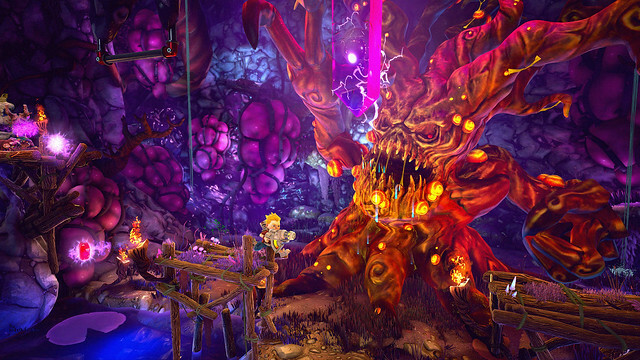 Rad Rodgers is a full game based on a previous release by 3D Realms called Rad Rodgers: World One. 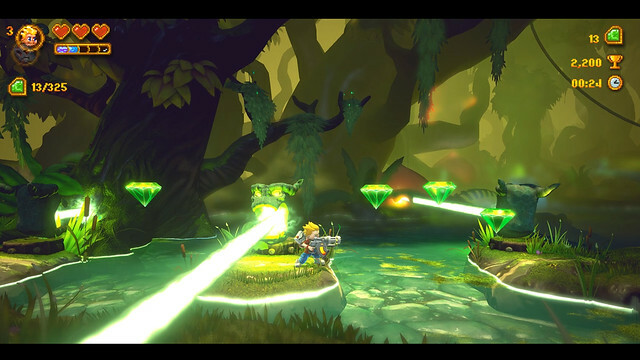 Nostalgic gameplay style with lots of throwbacks and references to the games it tries to emulate, however is it just another piece of fan-service or does Rad Rodgers stand up on its own in 2018? Graphics are great, very polished and vibrant. Lots of customisation in the graphics menu which is nice to see. Art style refers back to the games it imitates without being a complete rip-off. Personally there’s a juxtaposition between the 3D graphics of the game and the pixel art of the menus/HUD/etc which doesn’t work but its a personal preference. Graphics 8/10. The premise of the Pixelverse underworld is interesting and works well with the overall story of the game. 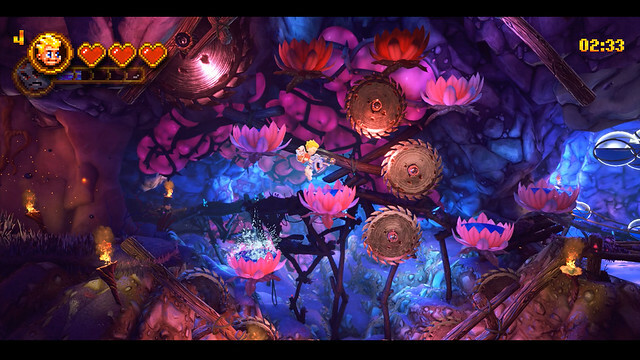 It is somewhat unique although is essentially the same as the underworld of Mario or similar so not a huge leap forward. Adds a little depth and change of pace but doesn’t make or break the game. Could be a lot more variety in the types of missions available. Overall the levels are very similar with not a lot of variety (run through the level and get 4 things) although the Pogo missions are a welcome change of pace, albeit brief and not particularly interesting. Would have been nice to see a lot more of the same minigame levels. 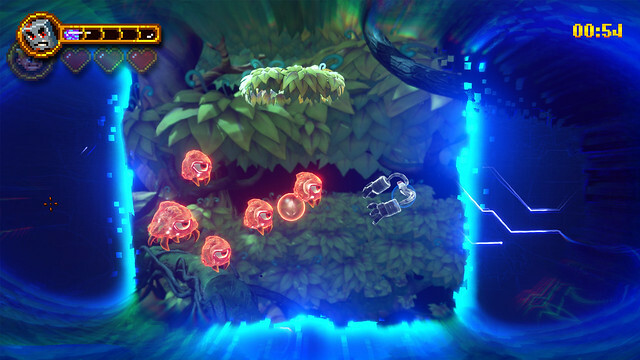 Gameplay 7/10 Its fun to play and tries to innovate but the levels are very samey. Controlwise, there is nothing groundbreaking but it is easy to pick up and a simple game at heart. We would like to have a few more options for attacks and to be able to switch weapons on the fly. The gameplay does suffer a lot from lack of polish, the hitboxes on platforms are hit and miss and sometimes it can lead to a poor experience, especially when trying to hit a perfect run. However this may well be patched out in the future by the developer. 7/10 the game is fun to play and can be rewarding but bugs let the side down on this front. 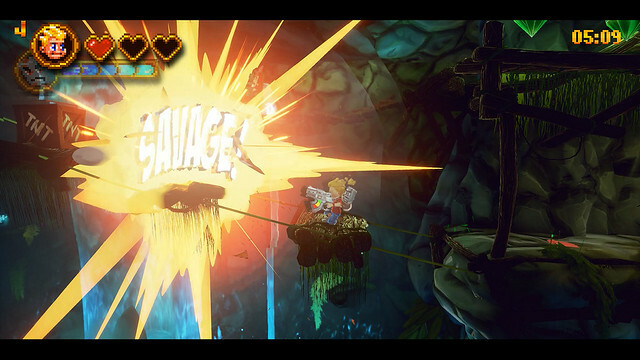 The tone of the game is very much dependant on whether parental controls are on/off and while we like to have the choice, we can’t see why they ever needed to make the game adult at all – the art style and premise of the game is not particularly adult themed so there is a strong disparity between the tone of the content and the look/feel of the game. Possibly its 3D Realms trying to throwback to Duke Nukem but it doesn’t really pull it off and the game would have been fine without the adult jokes that aren’t particularly funny. We did notice a number of glitches and bugs in the gameplay and found that they could be frustrating with vision being obscured for some of the time we were playing. Other players have also reported game saves being corrupted or deleted with no backup. 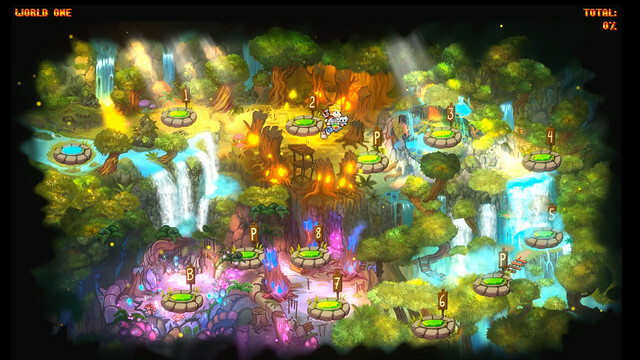 The game has a vast amount of collectibles of different varieties and will take multiple playthroughs to collect all the gems and so on, with some levels offering multiple paths through meaning that they will have to be played again. Depending on the type of gamer this may be a boon or a fault but if you do pick this game up and are a completionist, be prepared for some long evenings. Replayability 4/10. Again, uninspired level design lets it down, however this score could be pushed way up if you love to complete a game to 100% because there is no way you can without doing it at least twice. The sound of the game works well, the gameplay effects and music complement the visual feast from the art style of the game however we found the voice acting the be lackluster. As much as we enjoyed the sound design, we can only rate 5/10 for the poor voice acting and awful jokes. The game is fun with plenty of nostalgia for the 90s platform games that it takes its inspiration, worth a look especially if you have an interest in that particular genre and are looking for a more modern perspective on it. It is let down by some uninspired design and some contrasting themes that leaves the games feeling disjointed. For us the adult themed jokes were completely left-field and not worth including which did ruin the game somewhat, and weren’t particularly funny either. The graphics are excellent and really bring the game world to life with incredible depth and detail but the levels themselves are basic and not particularly challenging. 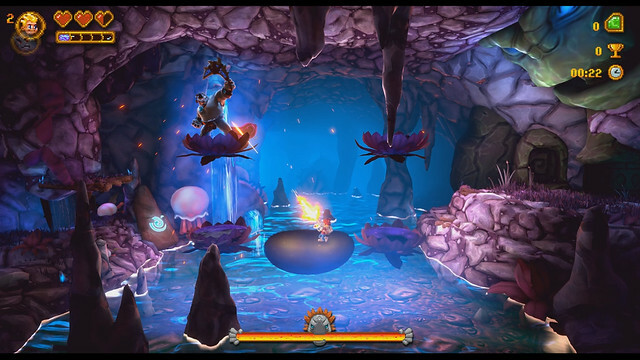 Overall we enjoyed playing Rad Rodgers and would certainly consider playing more of the game, although we cannot see 100% completion on the horizon. One to pick up and play now and then but wouldn’t hold our attention for long periods of time. We rate 6.2/10.